The document has been described as a scathing indictment of the CIA’s use of ‘enhanced interrogation’ techniques. WASHINGTON — Nearly a decade has passed since disturbing images first surfaced of Iraqi prisoners who were abused by their American military guards and interrogators at Baghdad’s now-infamous Abu Ghraib prison. The Abu Ghraib incident and subsequent revelations of waterboarding, sleep deprivation and other harsh – some would say torturous – interrogation techniques employed by the CIA in those early, post-9/11 years shocked many Americans. According to many observers, they also undermined the U.S. reputation worldwide and became a terrorist recruitment tool. The question now facing a key Senate panel – and, in particular, Maine’s two U.S. senators – is whether publicly revisiting the controversial “enhanced interrogation” techniques used by the CIA during that time is a necessary step toward transparency and accountability? Or is reopening a scabbed-over wound likely to do more harm than good? Sens. 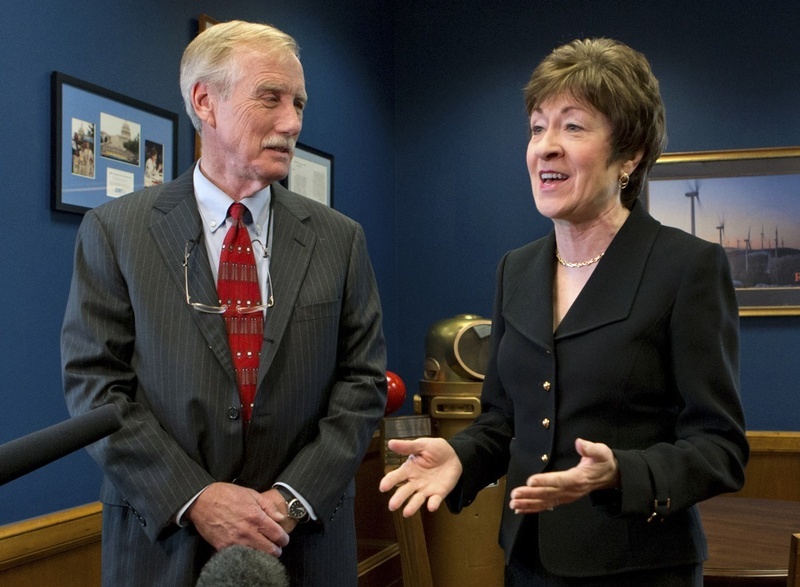 Angus King and Susan Collins could provide the swing votes on whether to release a secret 6,000-page report that has been described as a scathing indictment of CIA interrogation techniques used against suspected terrorists. Collins and King hold two of the 15 seats on the Senate Intelligence Committee, which prepared the report – albeit before either was a member. Collins is a moderate Republican occasionally willing to buck her party while King is an independent who caucuses with the Democrats but doesn’t necessarily vote the party line. Organizations and individuals who want the report made public are lobbying hard for the support of the two senators, writing op-eds, waging social media campaigns and contacting their offices. King said recently that he would “probably” vote to make the report public (most likely after the committee and the CIA redact the most sensitive portions). But he hasn’t committed all the way. Collins has not taken a clear stance on the issue. Her office said that the Republican continues to listen to Mainers and others as she weighs the implications of declassification. While she strongly opposes torture, Collins’ primary goal with the Intelligence Committee report is to “ensure that the report remains a tool for meaningful oversight and that it does not become a political issue that can be used by either party,” according to a staffer in her office. The latest buzz is that the committee may vote early next month, although that could prove to be another rumor. CIA officials have strongly disputed the report’s conclusions and said it contains numerous errors. Opponents of publishing the report also suggest that it will only give the country a black eye for now-discontinued practices while providing terrorist groups with additional recruitment tools. One person who knows first-hand what happens inside a military interrogation room thinks those dire predictions of an international backlash are way off base, however. Tony Camerino personally conducted more than 300 interrogations – and supervised 1,000 more – during the 4½ months he spent as a senior military interrogator with the Air Force in Iraq. Now a fellow at UCLA, Camerino said many prisoners entered the interrogation room with the view that all Americans are torturers based on the way their leaders used the incidents at Abu Ghraib and other scandals. Rather than providing new propaganda for those groups, the report will show the U.S. has acknowledged, confronted and corrected past mistakes, Camerino said. That, in turn, will provide a counternarrative to terrorist groups’ recruitment claims by showing the U.S. lives up to its principles. Camerino works with the groups Human Rights First and the Open Society Foundations, both of which are lobbying for the Senate Intelligence Committee to release the report. King said his recent meetings with top Israeli officials – including Prime Minister Benjamin Netanyahu – informed but did not necessarily sway his opinion on the need to continue negotiating with Iran. On Thursday, King returned from a six-day trip to Israel, the Palestinian territories and Lebanon during which he and Sen. Tim Kaine, D-Va., met with top officials from all three. A key focus of the trip was the sputtering Israeli-Palestinian peace negotiations. But so was Iran. Israeli officials are angry with the Obama administration for brokering an interim deal with Iran that eased some sanctions while limiting Iran’s enrichment of uranium and halting work on a nuclear reactor. Critics contend the interim deal – intended to provide time for a longer-term agreement – did not do enough to slow Iran’s alleged move toward nuclear weapons and eased pressure at a critical juncture. During their meeting, Netanyahu argued that the negotiations began too soon and that sanctions should have been allowed to work longer, King said. King, meanwhile, has spoken out forcefully against talk on Capitol Hill of voting to impose additional sanctions on Iran even while negotiations continue. That hadn’t changed as of late last week, despite his talks with Netanyahu and others. “It didn’t change my mind, but it certainly impressed upon me how important this issue is to the Israelis,” King said. The Senate is poised to vote on a veterans bill that contains policy changes sought by a Maine veteran who has become a national voice for military sexual assault victims. The omnibus veterans affairs bill would make it easier for veterans to receive compensation exams or review for disability claims for post-traumatic stress disorder, or PTSD, tied to sexual assaults that occurred during their military service. Additionally, the bill would impose more robust requirements on the U.S. Department of Veterans Affairs to track and report PTSD cases connected to sexual assaults. Those provisions were originally included in a Senate bill named for Ruth Moore, a resident of Milbridge in Washington County who fought for more than 20 years to receive treatment and disability compensation for sexual attacks she suffered as a young Navy enlistee. Moore said she never received proper treatment for the attacks and suffered emotionally and physically for decades. She went public with her story for the first time in 2012. The U.S. House passed another version of the Ruth Moore Act last year that was sponsored by Democratic 1st District Rep. Chellie Pingree, who has helped lead the push nationally to reform the VA’s system for considering disability requests related to sexual assaults. The Senate did not take action on that bill, however.